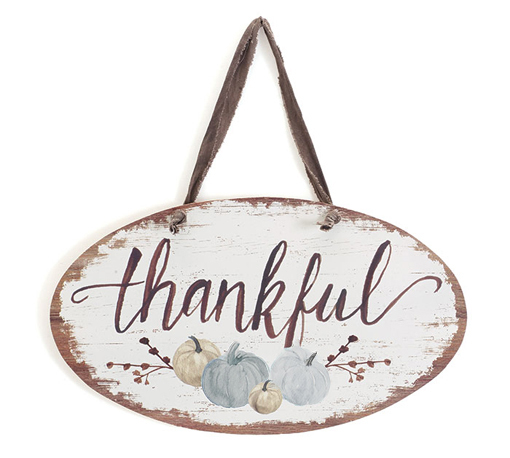 Home > Home Decor and More > Burton and Burton Wall Hanging "Thankful with Pumpkins"
Burton and Burton Decoupaged Wood Wall Hanging "Thankful with Pumpkins"
This "Thankful with Pumpkins" wall hanging from Burton and Burton makes a beautiful statement for any home. The wall plaque is made of decoupaged wood and measures 6 1/4" H X 11" W. It has a shabby chic distressed rustic farmhouse look. It features the word "Thankful" and tan and gray pumkins in the design. The neutral colors makes it great gift that will go with any decor.